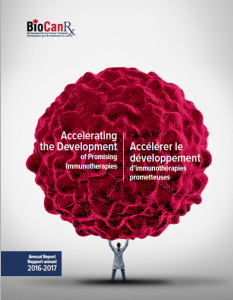 We are proud to present our annual report on BioCanRx’s many achievements in its second full year of operation. The 2016-2017 year marked a number of milestones for our pan-Canadian network. BioCanRx’s strong research program ramped up and funded 16 new projects including an investment to develop clinical Chimeric Antigen Receptor modified T cell (CAR-T) manufacturing in Canada. BioCanRx is investing in Canadian innovations and the best the cancer biotherapeutics field has to offer, always looking for a clear path to the clinic for the benefit of patients. We hope you enjoy reading about our accomplishments, activities, collaborations and partnerships. BioCanRx looks forward to continuing to accelerate to the clinic the most promising cancer immunotherapies designed to save lives and enable a better quality of life. Read the 2016-2017 Annual Report.